Network security group automation with Ansible, AWS, git, and Jenkins to move fast with security and auditability. Our team, Developer Infrastructure, is charged with accelerating application development while keeping our systems secure and stable. The ability to leverage Amazon Web Services’ (AWS) network security features (security groups), APIs, and tools were driving factors when adopting it as our compute platform of choice. While moving more and more of our applications to AWS, we found that centrally controlled network security administration would not scale to allow our teams to move as fast as they needed to. At Flatiron our products are rapidly evolving necessitating frequent updates to production network security rules. In May 2016 there were 26 such changes — more than one per working day! This post describes how we were able to build a safe, auditable way to configure network security that enables our developers and security stakeholders to move quickly. In the early phases of our AWS adoption we controlled security groups through both code and the AWS web console. This put us in a confusing situations. Changes made in the web console would be wiped out by executing our Ansible security group playbook. This would set all security group definitions to what is defined in our code repo. This is called Configuration Drift — and it lead to wasted time reconciling what went wrong and how things should be, as well as ambiguity around the preferred source of truth for the configuration. Since we have our desired state defined in code, we can allow our Jenkins workers to read the state of AWS and see if the reality matches our desired state. It alerts us when we’re out of sync. We defined a Jenkins job that runs every ten minutes and uses Ansible’s Check Modeto decide if any part of AWS’s configuration has deviated from our code-based definitions. If the Ansible playbook returns output indicating that any group definition would be changed or created then we have deviated from the codebase definition. Our top level playbook splits groups up by team for organization. Team-level playbooks define security groups that are aligned to that team. 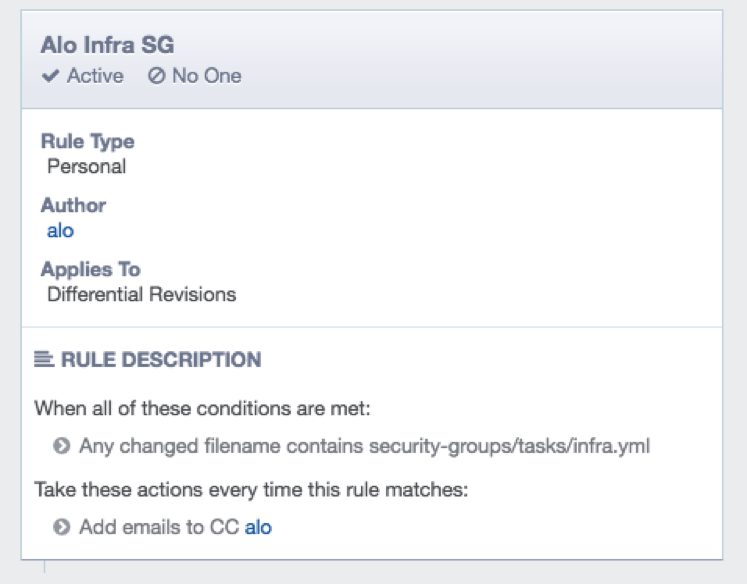 In the example below, the infrastructure team manages the Jenkins network security rules. Our check-security-group.sh script is runnable by Jenkins or users. It returns a >0 value (indicating an error) that is the number of changes that would have to be made to AWS to sync its definitions to what our repo describes. echo "ok: $ok changed: $changed failed: $failed unreachable: $unreachable"
In order for Jenkins to read the state of security groups, we assign it this IAM policy via an EC2 IAM Role. Simplicity: the core systems design principle. Complexity is inertia against change and participation. Our automation introduces no new systems or tools — just a new Jenkins build job. We were already using Slack, Jenkins, AWS, Phabricator, and Ansible. Our security groups rules were already defined as code. Introducing a diff uses our normal code review process. Reproducibility: if I cannot tear it down and remake it automatically, it is not simple. A destructive change to our security group definitions can be reverted or reset instantly. Transparency: I should be able to observe the state of the system quickly and easily. The configuration repo is simple to read. The status of compliance is a Jenkins green light or red X.
Visibility: when things are going wrong the right parties should be notified. Chat notifications related to the Jenkins job alert administrators when eyes should be on. Consumers of network security may opt into monitoring configuration management files via Phabricator, our code review tool. For example I am CC’d on all infrastructure related security group changes. Auditability: I should be able to say what has happened before by observing a system of record. Our Jenkins build record shows all deviations from approved configurations. Every line of our security group automation is attributed to a commit/author, and a commit that ties back to a code diff which shows security or engineering approval. Self-service: improvements and additions are not only the domain of sysadmins. All engineers can suggest changes and observe what currently exists. Why only allow admins to execute changes? We wanted to allow as much self service as possible — when considering security vs ease of use tradeoffs, we decided that a single gatekeeper to production step was the best tradeoff for us. We think trading off between moving fast and staying secure is a false dilemma. We hope to allow our teams to move fast and stay secure through workflows like this.